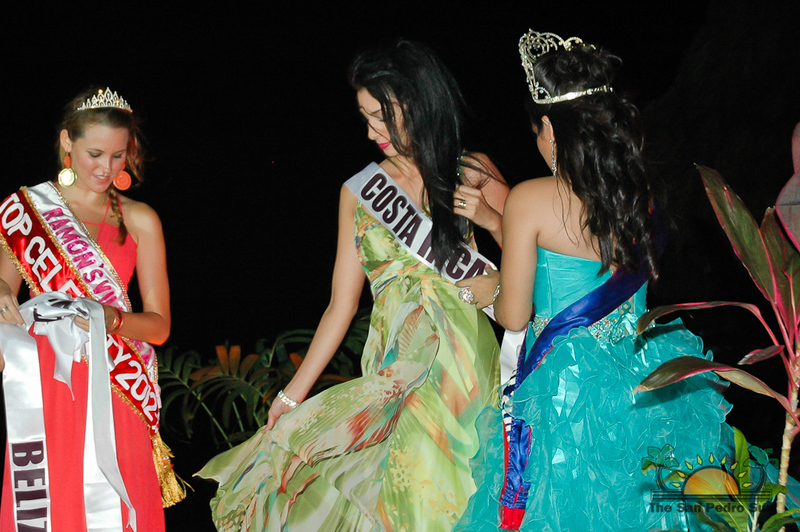 « Older: Official Countdown to the 20th International Costa Maya Festival BEGINS NOW! 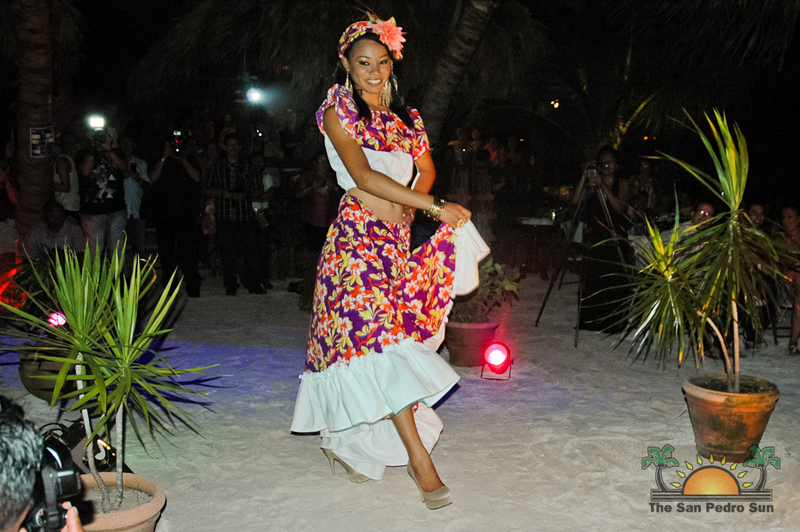 The island is gearing up for the highly anticipated annual Costa Maya Festival. 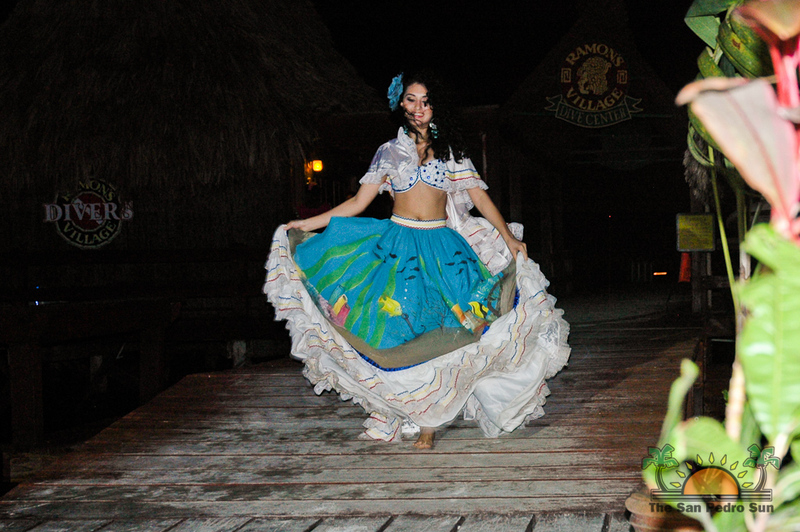 With all the delegates for the La Riena de la Costa Maya Pageant on the island, everyone is eager to get a glimpse of them ahead of the big stage appearance scheduled for Thursday August 2nd. On Saturday July 28th, islanders had the opportunity to meet, greet and socialize with all delegates at their first big public appearance at Noche Tropical hosted by Ramon’s Village Resort. 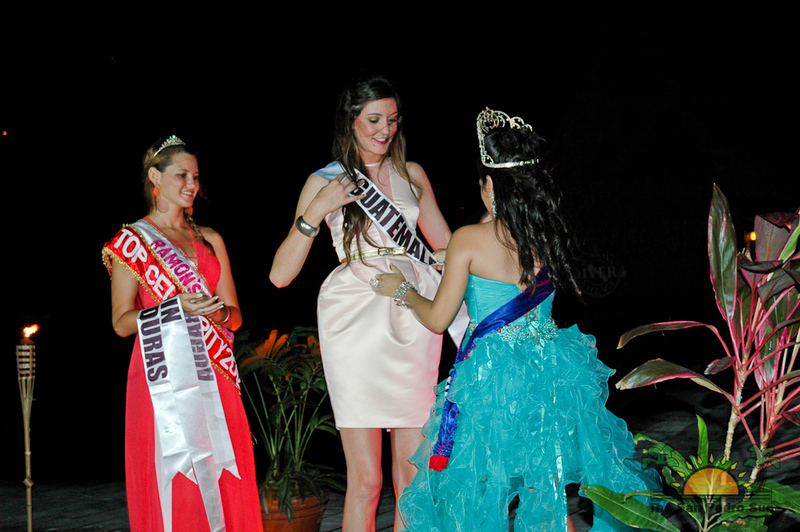 The main purpose of the event was to officially introduce the delegates to the community along with the official sashing ceremony for all eight contestants of the pageant. 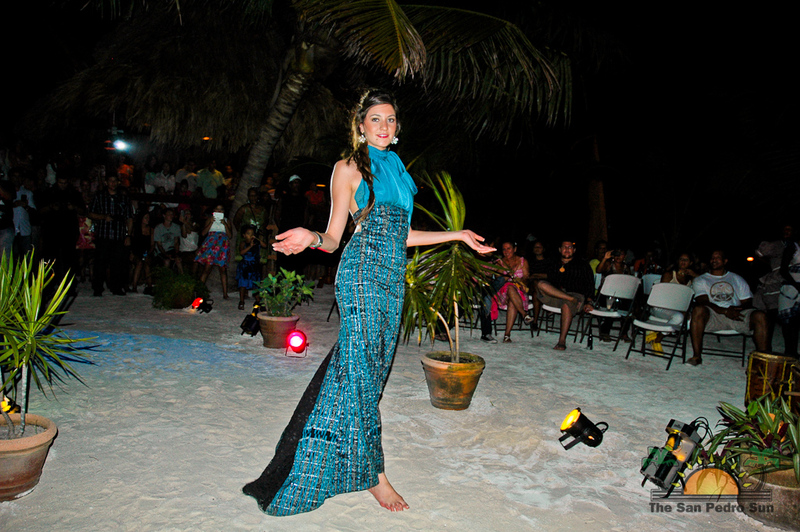 Noche Tropical took place under the stars at the beach side just in front of Ramon’s Village Resort. Tiki torches, colorful lighting, lively music, the rhythm of the Garifuna drums and a cool sea breeze all made the right combination for a Tropical Noche indeed! As an annual sponsor from its Sea and Air Festival days, and the delegate hosts since the start of the pageant, Ramon’s Village Resort staff was happy to organize the event for the second consecutive year. This year’s delegates are Miss Guatemala - Alessandra Manzur Franco, Miss Mexico - Natalia Villanueva, Miss Nicaragua - Ivey Jellisa Alvarez Hunter, Miss Costa Rica - Mariela Aparicio, Miss Belize - Karen Jasmine Middleton, Miss Panama - Karen Elena Jordan Beitia, Miss Honduras - Esthefany Maolyth Piñeda Perez and Miss El Salvador - Nathaly Jazmin Mena. The delegates each introduced themselves by name and explained that they were happy to be in Belize as beauty ambassadors to their country. After they each introduced themselves they were sashed. 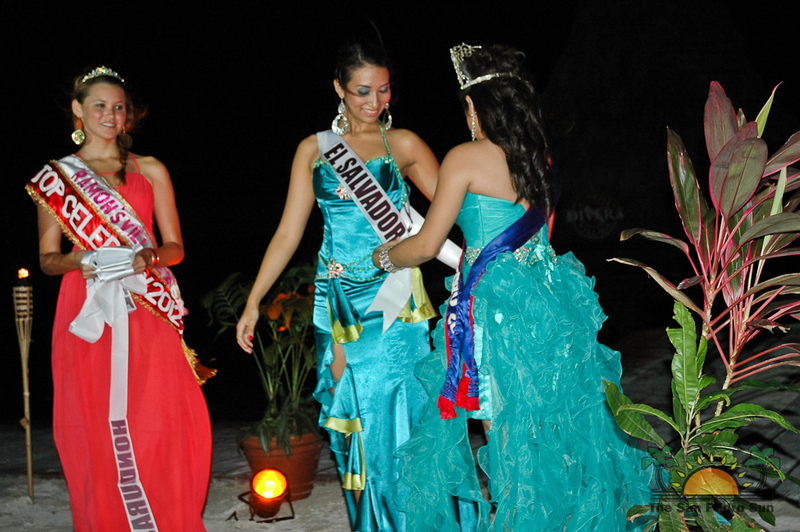 Once officially sashed by Miss San Pedro Yakarelis Hernandez with the assistance of Miss Ramon's Village Resort 2012 and Miss Top Celebrity 2012 Christine Syme, the delegates then showcased typical cultural costumes from their respective countries. The cultural costume competition for Noche Tropical is different than what will be presented on pageant night (a carnival type cultural costume) and the results have no weight on decision of the judges for the actual pageant. However, it was noted that there would be a points system that would be added to the final score for the Cultural Costume segment of the competition - as the costume competition is separate from the final decision on who will take the crown. Each delegate graced the audience with just a snapshot of their country’s culture as they paraded the aisle while three judges sat keenly observing each costume. 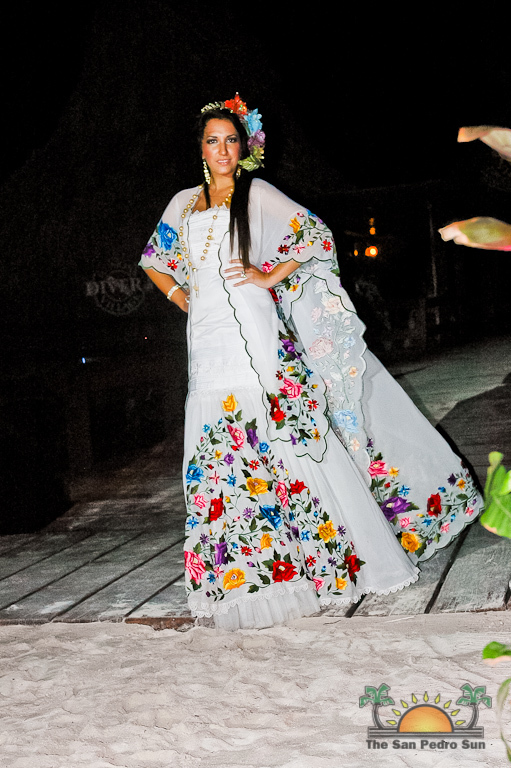 Each cultural costume was unique and had significance to the lives of the people who proudly wear them. 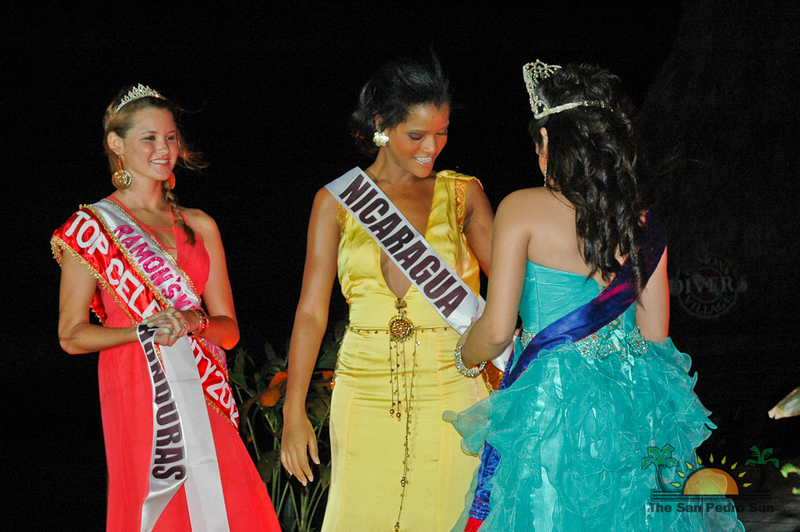 The results of the Noche Tropical cultural costume competition will be announced during the pageant. Following the cultural presentation, they all participated in a fashion show displaying outfits from MoonDancer Boutique. Again all girls walked the sand runway clad in swimsuits, island casual and cocktail attire. As each delegate was called, the crowd cheered and applauded. But islanders were in for a treat as Miss Honduras Esthefany Maolyth Piñeda displayed her talent as she danced to the rhythm of traditional Honduran Punta. After all the formalities, delegates from each country interacted with members of the public that were eager to have their take pictures taken with their favorite delegates. The official hotel of the delegates, Ramon’s Village Resort, were delighted to have hosted the event and already planning on making the event bigger and better next year. The Costa Maya Festival Committee would like to inform the public that children holding tickets ($60 Season Pass) will be able to get unlimited rides on the mechanical rides from 7PM through 11PM.